Yas Hotel Abu Dhabi (formerly Yas Viceroy) is a fantastic 5 star resort on the beautiful Yas Island, Abu Dhabi. The complex spans across both water and land and is another one the state’s architectural masterpieces offering guests a unique staying experience. The interior of the resort encapsulates a contemporary way of thinking with the free flowing curves of the wall and ceiling leaving guests marvelling at its beauty. The hotel perfectly situated within walking distance of a fabulous beach which acts as the ideal setting for guests to relax and spend their day soaking up the spectacular sunshine. The hotel also provides guests with stunning views of both the serene harbour or the world renowned Yas Marina Circuit which is arguably one of the most famous tracks on the F1 schedule. Furthermore, with a superb 18 hole golf course just a chip and putt away there is something for everyone at Yas Hotel Abu Dhabi whether you are a family looking for the dream holiday destination or a group of golfers looking for somewhere to stay in between rounds. We found 0 offers matching your search. Yas Hotel Abu Dhabi is comprised 499 lavishly designed rooms and suites which range from 64 square metres to 409 square metres of space to relax in. There are a number of different types of rooms for guests to choose from whether they wish to stay in the Deluxe rooms or one of the Suites. The deluxe rooms are perfect for those who wish to spend a lot of the stay enjoying the beautiful sunshine from besides the pool or taking part in one of the numerous activities that the resort can offer, the room also has a balcony which is the ideal place to enjoy the stunning views of the race track or the marina. In addition to rooms, the hotel also offers guests the chance to stay in a number of luxury suites all varying in size making them the perfect place to relax throughout the day and night if you wish. The Island Suite is the median in terms of size and gifts guests with 145 square meters of floor space as well as a generously stocked mini bar, wonderful bathroom and a beautiful balcony. The resort has an outstanding number of 5 star facilities which guests are encouraged to use at their leisure. There are 6 different world class restaurants for guests to dine in ranging from Italian to Japanese, everyone's culinary needs are met at Yas Hotel Abu Dhabi. Furthermore, for those who feel inclined to enjoy a pre or post dinner drink the hotel has 3 different bars for guests to choose from. The Latitude and Longitude Bar runs adjacent to rooftop infinity pool and provides guests with fantastic views of the glorious sunset. There is also the Skylite Rooftop Lounge and the Rush Nightclub which open till late with a resident DJ playing the latest music for you to enjoy. Yas Hotel Abu Dhabi also offers guests the chance to enjoy a state of the spa and wellness facility which is an oasis of tranquility amongst this buzzing resort. The ESPA Spa offers a number of different signature treatments unique to the hotel and also allows guests to use the steam room, hammam and jacuzzi whenever they wish to throughout the day. In addition to this, there is also the fantastic Abu Dhabi gym where you can enjoy a vast range of 5 star equipment as you stay fit and active during your dream holiday. 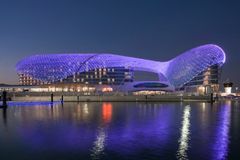 Moreover, Abu Dhabi is vastly becoming one of the best golfing destinations in Asia and the Middle East and the Yas Hotel Abu Dhabi is the perfect place to rest up in between rounds of golf. Within walking distance of the hotel is the glorious Yas Links Golf Course which is the first links golf course in the Middle East and also provides guests with the chance to play floodlit golf on the par 3 academy course. Guests can also hone their skills with a lesson from one of the clubs PGA Professionals.